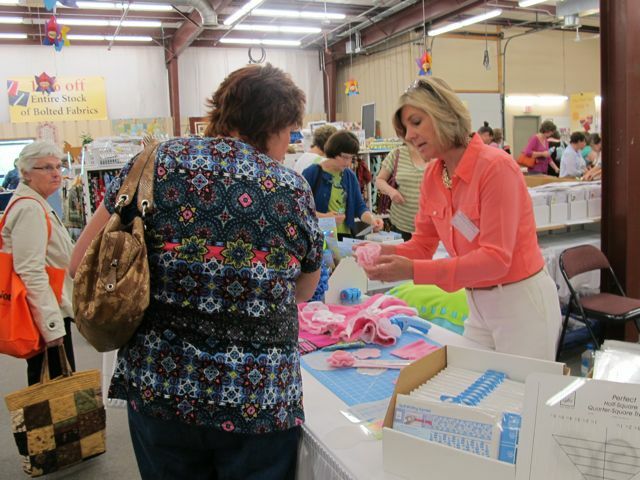 Celebrate the 34th annual Nancy’s Notions Sewing Weekend, May 3–5, 2018—in Beaver Dam, WI. What started as a grand opening in 1985 has grown into one of Wisconsin’s largest annual sewing events. This year’s events start Thursday, May 3rd, and run through Saturday, May 5th. FREE Admission and FREE Parking! Find seminar details and class ticket pricing over at the Nancy’s Notions website. Test-drive a Baby Lock Sewing Machine! Hands-on classes are running throughout the weekend. While many are sold out, tickets for select days and times are available onsite at Nancy’s Notions Sewing Weekend. Find details and class pricing over at the Nancy’s Notions website. Tickets for Thursday’s evening event with Linda McGehee are available onsite at Nancy’s Notions Sewing Weekend. Note: A special evening event celebrating Eleanor Burns’ 40 years in the industry is sold out. Company representatives from some of the top brands in the sewing industry are available at Sewing Weekend to answer questions and demonstrate products. Don’t Miss the 3-Day Super Sale! Over 10,000 yards of fabric on sale; and more! Save up to 75% on select Clearance and Overstock items. New deals daily! Ride the FREE! shuttle buses to seminar locations. You can even check your packages while you’re attending seminars and workshops. You’ll find lots of inspiration! Scott Stanton, accounting and IT guru, sports one of his personalized ties. Yes, Scott made it himself. Every day of Sewing Weekend he wears a tie that he made. Look for the Quilt Expo Black & White Plus One Award-Winning Challenge Quilts at this year’s Sewing Weekend! And, pick up an entry form for the New! 2018 Quilt Expo Bake Off Quilt Challenge. Join us in celebrating the 34th annual Sewing Weekend, May 3–5, 2018—at Nancy’s Notions in Beaver Dam, WI. What started as a grand opening in 1985, Sewing Weekend has grown into one of Wisconsin’s largest annual sewing events. Remember the first Sewing Weekend? Thank you to Nancy, for her vision in creating an annual event for us to gather and celebrate sewing. This year, we celebrate Nancy and her many contributions to the sewing world, her elegant style and gracious living. Did you attend the 1985 Grand Opening Event? For a chance to be the random winner of a Farmhouse Floral Fat Quarter Pack, please share a comment below. I have been to several sewing weekends, and love them even better than the quilt expo! Looking forward to this year! I di not attend. I do not live close enough to nancy’s notions store. wish I could go. sounds like sewing fun. I was not able to attend. Back then I did not know of Nancy. This event is on my Bucket List for every year in retirement. I am enjoying looking forward to this and just might have to “sneak in” a pre-retirement weekend. I did not attend the grand opening in 1985. I wish I could attend the event this year, it sounds awesome. I did not attend. It looks like it would be a fun event! I did not attend the Grand Opening Event, but someday I would love to attend the Sewing Weekend. Thanks for the great giveaway! I have attended almost every sewing weekend since it started. I enjoy the chance to go to seminars and the shopping is fun. The first time we were in the warehouse it was almost overwhelming. So thankful to have met Nancy and I enjoy taking classes from her staff through the years. Looking forward to my 4th year attending. Made even better this year as my husband and I have “retired” to the area from Milwaukee. Thank you to her dedicated staff and friends for continuing this tradition. I attended a sewing expo in Denver more than 20 years ago and participated in Nancy’s seminar when she offered a class. I have watched Nancy on PBS Saturday mornings for more than 20 years and have learned so much from her teaching and books, as well as online access. I have used the online store as well. Thank you for keeping the businees going. I am excited to be able to attend the May weekend this year for the first time. I have watched Nancy’s Notions on TV for years. I have attended the May and September shows for more than 20 years, which equates to 20 years of learning new techniques and patterns from Nancy and all the wonderful sewing people, especially Mary Malari (sp? ), the sweatshirt makeover diva. Nancy was able to simply so many patterns for me and I now share the love of quilting with my daughter. Thanks for being there for all of us, Nancy. And a big thank you to the staff and owners of the company for continuing this tradition. I started attending the sewing weekend when I retired 7 years ago. Now I won’t miss it! Speakers and sales are fabulous! Nancy Zieman is the Most soft spoken expert seamstress I ever watched. I wished I could have met her. I get up early ever Sunday and watch her TV show. She just explains everything on a level I understand. My hope is come next year with my sister. I love sewing weekend and wouldn’t miss it for the world. We will definitely miss Nancy though and will think of her often. I have not been to a sewing weekend. I made my first visit to Nancy’s Notions store in Beaver Dam last summer. I look forward to this year’s sewing event. My sister and I are planning quilt projects–we are planning a quilting bee for two. I’m thankful for all the tips we can get from Nancy. Thanks to those who are carrying on in her name. I did not attend the first event, but I thoroughly enjoyed being able to attend last year! I went with my mother and sister last year. We even got to meet Nancy!!! I can’t wait to go this year! I did not attend the 1st but I have attended every year for 20 years. It was always a wonderful weekend with my Mom and Aunt. My Mom passed away 3 years ago and now my niece joins us. Nancy has been a part of our lives for more than 20 years because we watched her even before we started coming to Beaver Dam. We will miss her and her blonde jokes. She was a gracious and humble woman. I didn’t go to the first event but I was very happy that my Mom, sister and I were able to go last year. When we went it was extremely exciting that we were able to meet Nancy Zieman !! I am looking forward to attending this year also. I did not attend the first meeting. It would have been wonderful to have been there. 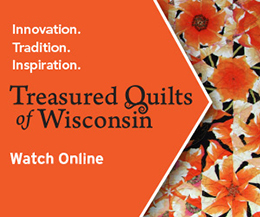 Nancy was a great influence on the quilting world and will continue to be so. We all miss her. No, I did not attend that first event tho I have watched Nancy on my local PBS channel for decades. I wasn’t at the first event. However, I was absolutely thrilled to be able to go last year with my two daughters for the first time. The highlight was meeting Nancy and getting a picture with her, it was a very important experience for us. She has been a very large part of our life, teaching us thru her public tv show how fun sewing is! I even had mugs made at Christmas including that picture for the 3 of us. It is a wonderful memory we will always share. I was not there for the 1985 grand opening. I’m sure that is a great memory for those who did. The farmhouse floral fat quarter fabric looks so sweet. My daughter and I have been going to the warehouse sale for the last five years or so. We really enjoy it. We always come home with something new to try. I have been to many of these events, but not the first one. I wish I had. I and my sisters, and even my mother in 2010, have visited the Sewing weekend multiple years. It is a wonderful time and a great sale. My sisters and I have all purchased machines from the weekend at very good prices. I was not at the 1985 event but would have liked to have been. Nancy Zieman is my hero, RIP Nancy.. I have never attended a show. It sounds like a bucket list item when we come to Wisconsin again !! I have never attended this event but I hope they continue with it. I loved watching Nancy’s shows. She will be missed. I’ve never been to this event but it is on my bucket list. I had so hoped to meet Nancy as she was one of my super stars. The fabric is just beutiful. I have never been, but would love to come out sometime. But the distance is too far right now. I miss Nancy’s shows on TV. Someday I plan to pack a bag and visit the store. That is on my bucket list to do. I wish I had known about Nancy’s Notions in 1985 but wish I had. I hope to attend sometime in the near future. Glad to see that Nancy’s traditions are being continued. world. GOD BLESS HER FOR HER CONTRIBUTION TO TEACHING THE WORLD TO SEW. No, I did not attend the 1985 Grand Opening Event. Nancy had a truly remarkable gift, so many of us are blessed to have learned from her. Thanks to those who will carry on her life’s work in her absence. I wasn’t a quilter then but I continue to learn from ALL of Nancy’s past shows. She was an amazing woman and I am sure we ALL miss her terribly. When God calls you home we have to go. Her shows will continue to be a tribute to her memory. The florals are as beautiful as Nancy’s Spirit. I have never attended but looks like an event I would really enjoy. I wasn’t at the first one, but I went to several when I lived in MN. Now I live in CA and can’t attend, but I sure want to. Sewers whether quilters or garment or home dec or whatever they do are the best. Everyone shares with everyone and it is so inspiring to be there and participate. It is an awesome weekend! I’ve attended this event starting when you moved into this location. We would attend 6 lectures a day. Eat a wonderful box lunch at the Hockey Rink, that was decorated with flowers from “Jim”. Meet women the year of the flood in the Midwest I think it was 1995 or 96. Their husbands told them to go & enjoy themselves. It was very moving. I can’t tell you a better way to use your vacation time that to drive to this event. It is the most organized chaos I have ever seen be side the sales. Plan to see you there. I did not attend the first one, but it wasn’t long after that I started to attend them, and have been going ever since. Nancy was a great inspiration and will be missed. No, I have never attended. Would be a good weekend to enjoy all the sewing people. I did not attend; I wasn’t quilting yet in 1985. Now I enjoy quilting and learning from Nancy. Thank you for continuing to share her legacy. I did not attend, but would like to attend someday. I enjoy Nancy’ s show on PBS. What a great teacher. My friend and I have been coming up to Nancy’s since she opened. Way back in the beginning could only come 1 day due to 5 little ones at home. Have enjoyed it immensely. From the first day it felt like you came home to family. Everyone so friendly and helpful. I have become friends with some of the old Nancy employees. I will miss Nancy so much. She was right there with you and laughed at her own mistakes instead of covering them up. Always had a blast. Unfortunately no, I have never had the opportunity to attend the sewing weekend event. I hope to one day. Thank you for the beautiful fabric give away! I’ve never attended, but I wish I could. Wish I could attend but too far away. Love the farmhouse florals giveaway! The fabrics are absolutely beautiful. I did not attend but sure wish I could. It sounds wonderful. I started Quilting in 1973 and Nancy was always always a big part of my quilting and sewing learning. Thank you so much for continuing her website and blog. I did not attend due to the distance. However, I do have many VCR tapes of Sewing with Nancy. Yes, I do have a VCR recorder and still play the tapes. Thanks to Nancy I am a better sewer. I enjoy the sewing weekend, I’ve been to several over the years! I have not attended any of the sewing weekends, but I am glad you continue to have them because someday I might get to one. I am sure you would teach me something new! I have not attended the event, but really wish it were possible for me to do so. I love that Nancy’s legacy continues. Thank you. I was not there, but I have been a fan of Nancy’s from the very first. So happy you are keeping her wonderful spirit of giving of herself and her talents alive for us. Being from Texas, I don’t have a chance of coming, but sure wish I could. I did not attend the original sew-in because of distance (I live in SC). However, I have watched Sewing with Nancy for many years and Nancy inspired one of my first quilts – a Rob Peter to Pay Paul. No one told me that it was a complicated pattern and Nancy broke it down into easy segments. I made it for my granddaughter and it inspired her to learn quilting also. I would love to win the fabrics. I did not attend the 1985 event and will not be able to attend because of distance, but have enjoyed Nancy’s show every Saturday morning on PBS. I have learned many sewing techniques from watching the show. Even my husband (who knows NOTHING about sewing) enjoys watching Nancy. He has always said she is so classy and makes everything seem so “doable”. O how I wished I lived 1000 miles closer to Wisconsin instead of in sunny Florida. I remember seeing ads in the sewing and quilting magazines earlier about a catalog business and thinking I needed that catalog. Nancy had so many practical solutions to what I thought of as the most difficult problem of the day. After reading the answers to questions and the new products and books that seemed to come out ” daily “, I was struck by the common sense and simplicity of the solution. I know that you all miss her terribly but will be grateful for your time with Nancy and family. Have fun this weekend. I did not attend the 1985 event. I’m sure it was exciting. I would love to attend this type of event. I enjoy watching Nancy’s TV show every Saturday on PBS. I would love to win the jelly roll. I quilt a lot and love to sew. I live in Texas and could not attend because of the distance. I have been inspired by Nancy for many years from her TV presence. She always made things seem within my reach. That encouragement she always give made her a very special person in my book. Thanks Nancy! I live in New England, but I am glad that Nancy’s legacy continues on the website. nancy was a great teacher and i miss watching her programs. wish i could be there. I have attended sewing weekend for many years. Nancy was a true inspiration to so many of us—knowledgeable, patient, down to earth and always kind. Many of us will be thinking of her as we shop and learn. I was not at the event in 1985, but have attended for almost 20 years. I describe it as my “non negotiable week of vacation”. It’s good that my bosses understand! Thank you Nancy. What a wonderful teacher you were. I did not attend that one but have attended in recent years and it was an awesome experience. Last year I had the privilege of visiting with Nancy and she took my picture with a bag I made from one of her patterns for her Facebook page. Her books are outstanding and her inspiration is unending. Thank you for keeping her legacy going. I didn’t attend. I just started quilting recently and have learned a lot from Nancy’s past shows. She will be missed. I live in Florida and hopefully can attend next time. Love shopping online at Nancy’s Notions. The list of speakers is awesome. I didn’t attend, but I started learning from Nancy around that time. I did not attend. I was not a quilter nor sewer in 1985. It would have been sew much fun to be there. The farmhouse florals are so beautiful! Books and enjoy going back and reading again and again. I didn’t attend, but would have loved to. That would have been a chance of a lifetime. I’m greatful her shows are still airing.